CoasterRadio.com - Theme Park Blog and Podcast: What is the best money you've spent at a park? A day at the theme park can be quite expensive. You have to pay for parking, admission, food, and drink. You might even pay for souvenirs or upcharge rides. But sometimes, you can spend money at the parks and really get an excellent experience. 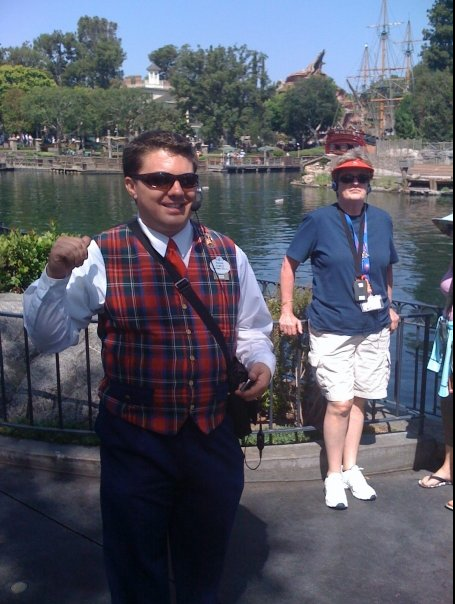 The best money I ever spent at a park was at Disneyland when I took the "Walk In Walt's Footsteps" tour. For three hours, a personal guide took us around the park and told stories about how Walt created the "Happiest Place on Earth." The cool part about the tour was that each participant got to wear headphones that were wirelessly connected to the tour guide's microphone. He also played us audio clips of Walt Disney himself talking about his park. At one point, the guide played us the audio from Walt's opening day speech as we stood in the exact place where he delivered it. Very cool. So, our interactive question for this week's show is: what is the best money you've spent at the park? Tell us your thoughts on the blog by using the "Comments" link below. You can also e-mail us by using the address over on the right or use our Contact Page! Disney pin trading. If you go to Downtown Disney in Orlando, FL, they there have the largest selection of Disney pins around! You can also find them at parks. There are different sets, for example, my cousin collects Pirates of the Caribbean, and they have a special thing that goes around your neck (like the ones for media day) and it is created just for those type of pins. If you are a hard-core collector, you will always believe the best money is spent on the pins! The Wild Africa Trek at Animal Kingdom. This is the newest tour at the Disney World Resort, but also the most different. Unlike the other behind the scenes tour, you not seeing the inter workings of technical side of a theme park. This is a live 3 hour tour with real animals and mock up danger set's with up close and personal views of some the most deadly animals. Think of it as a safari with the Disney touch. I don't spend much money when I'm inside the park. The one thing I do spend money on is t-shirts from the park. It's the one thing I get at every park I go to, because they are useful every day and they don't just sit there and collect dust like other collectibles do sometimes. The only park that I've been to and haven't bought a shirt at is Disneyland, but I have one from Disney California Adventure! I generally don't spend much extra money in parks, but a good deal will sucker me in every time. At Dorney park they had a special most of last summer where you pay $5 and get 2 rides on thier screaming swing upcharge ride. I had never ridden one before and I loved it! As a season pass holder to my home park of Six Flags Great America, I am there quite frequently. I could think of three ways that I really felt that I have spent my money to its greatest potential. The first is the purchase of the season pass with parking so I can visit frequently and have the fun last all summer. Second, is the promo that Six Flags was doing in the 2010 season that with every shirt purchased came with a free exit pass to any ride in the park. It really came in handy to avoid the 2+ hour wait on busy days. Third, is the upcharge for the sky coaster that gave me an instant thrill that was unique unlike any coaster or ride and there was no wait time. Being a movie fan, buying props or replicas of famous icons from films is what I go for. Stuff like Indiana Jones Jacket or Hat is worth the time. It's great to relive or being that character. Walt Disney Resort thats worth the price. Having a VIP tour guide that can customize your trip to your liking makes things so easy, but this is costly. One thing worth wild is the NASCAR Richard Petty Driving Experience. Having the chance to ride or drive these racing cars is so fun. They even have Indy racing cars to test your need for speed. I believe the best money spent at the park is when the park is new. Grand openings, or you first time you are there is what properly the best time to get something to remember it by. After a while it mostly about setting up the meals and the tickets. What worth while is whatever new attraction comes out which makes you want to remember it by. But the first time is the special time and there alway's something to remind us about that time, whether it's the ticket, map, t-shirt,key chain, photo, etc. It's all memories trap in a bottle. The first time your at the park is properly the best money you spent at the park. Grand openings or your first time there is what makes you buy something special at the time. After a while setting up meals, hotel, tickets is more important then buying that key chain. Unless it's a new attraction that wows you into buying something at the gift shop, a lot of merchandise becomes irrelevant. But most of the time it's the first time, and those items like tickets, park maps, t-shirts, photos, towels, fake-park money which will hold a special place in your memories. I have another one. I'mma go with tom about the same park in about the same place. But instead, I'm gonna say the water blaster! It costs 5 cents, and I'm serious, we spent half of our money there. What they do, is there is a point on the Rat Bilges river rapids ride where riders go under a bridge. Well, there are different #d machines and matching hoses. So when you press a button, water comes out from your hose number and people scream! It's so funny to see their reactions.